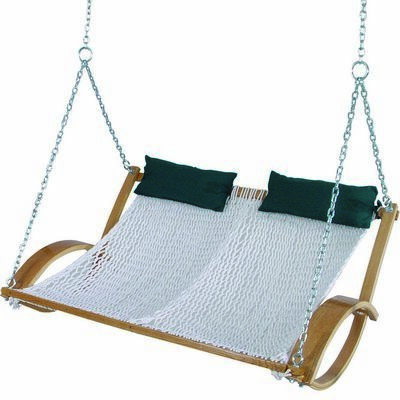 Settle into a luxurious Cushioned Double Swing for some rest and relaxation. 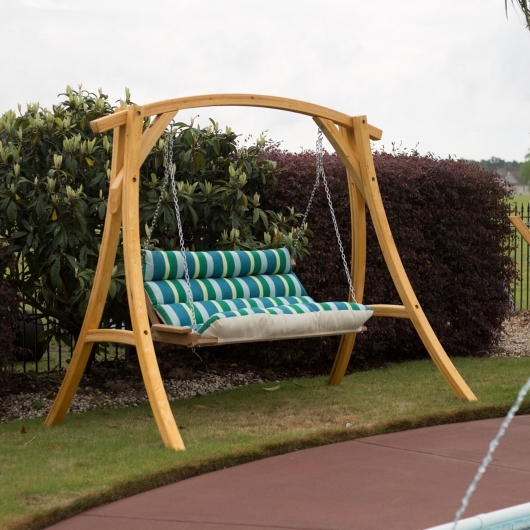 Made to accommodate two people, the swing measures 60″ wide and is 42″ deep. Perfect for two, indulgent for one. Our Porch Swing is great in all climates. 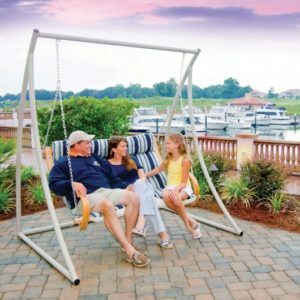 Constructed from DuraCord® and Sunbrella fabric, it is designed to resist mold and mildew and will not support any microbial growth. To top it off, this material is super soft to the touch – like cotton. Our exclusive S-Shaped Camaru Wood arms are dipped in marine spar varnish to ensure long life and a stunning shine. The zinc-plated steel hardware is designed to resist breakdown from harsh elements and ensure strength and safety. 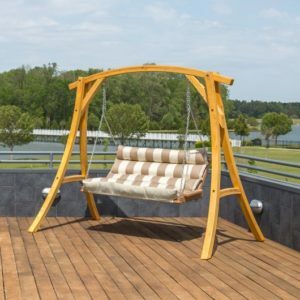 If you are looking for the ultimate in porch swings, look no further. We have an optional sun shade canopy (shown) for those needing some shade. DuraCord and Sunbrella fabric for color fastness, stain and mildew resistance, and long outdoor life. Polyester fiber filled padded cushion (1 1/2″ thick) for quick drying and supreme comfort. Brazilian Teak Camaru hardwood arm rests, one of the strongest hard woods around. Zinc plated steel chain for supreme strength and long life in the outdoors. Wide enough for two – Seat Cushion is 51″ wide and 42″ deep. 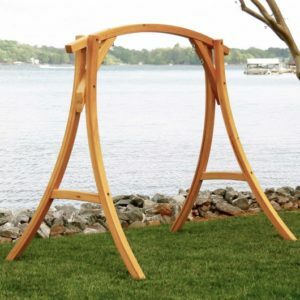 Easy to hang inside or out. 1 year warranty against defects in workmanship. 400lb capacity – weighs 35 lbs.